At the Color Room we have created an atmosphere in which you can relax and feel confident that you are going to receive the best products and the most talented professionals available. We specialize in corrective custom color and foiling techniques, exclusively using Goldwell Hair Color of Germany, the number one hair color worldwide. All protein color for the hair, as well as the lasted fashion and beauty trends by international color experts using European techniques of hair color treatments. Treat Yourself ! At the back bar with our # 1 is beautiful thick healthy hair. With that in mind we have created a system that without a doubt will be a ultimate experience. 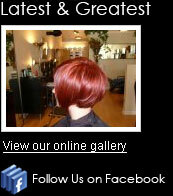 Trained professionals prepare individual custom blended European conditioning treatments. We are proud to announce Kerastase, Paris as our ultimate treatment products, with only 1000 salons in the U.S. offering this exclusive product, we will be sure to educate you on all your product needs. Not only does your hair benefit, your mind and body also benefits as you relax in a full length chaise lounge, with your choice of herbal teas, espresso, cappuccino, white wine, iced tea or freshly brewed coffee. Feng Shui was an essential tool used in designing our salon and our treatments for a total energetic and soothing experience.